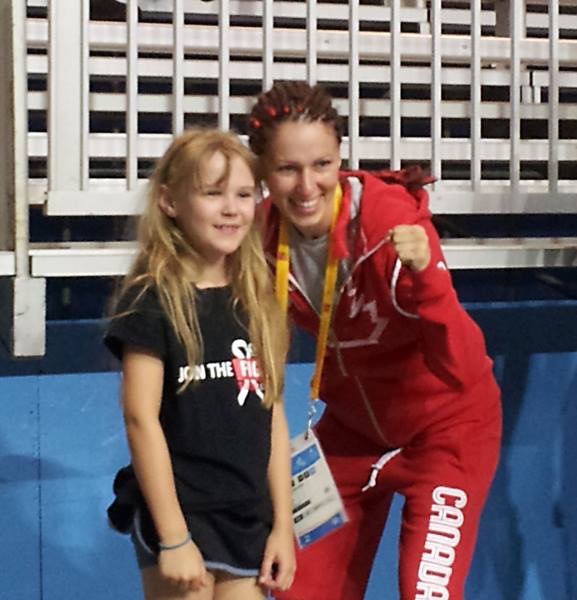 51kg Women’s Elite Boxing GOLD Medalist posing with Abbey after her fight in the Pan Am Games. Abbey’s Mom Dawn Ramsey-Brown fought in the 2014 Fight To End Cancer. A key component to the Fight To End Cancer Gala, is the promotion of women in boxing. Through this initiative, each year’s co-Main Event features a female bout, which always proves to be the “fight of the night”. Last year, we were honoured to have Mandy attend our Gala, as a medal presenter for our co-Main Event – featuring voice actress, Erica McMaster and Paige Cunningham, from the Princess Margaret Cancer Foundation. Qualified for the Rio 2016 Olympic games and working tirelessly to achieve her dreams, Mandy has a lot to fight for. Though she has her hands full with 4-6 hour training days, Mandy still finds the time to join us in the Fight To End Cancer. 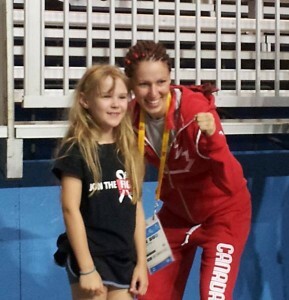 We are so proud to have Mandy representing Canada at the 2016 Olympic Games in Rio and we are honoured to have her as an ambassador of the Fight To End Cancer. Mandy Bujold (born July 25, 1987) is a Canadian amateur boxer, whose career was launched following a successful 2006 when she claimed the Canadian National Championship and Boxer of the Year titles. Weighing in at 51 kg (112 lbs. ), she has made her way as a Fly Weight Champion, with a trail of titles and victories following her. Included amongst her many achievements are: 9 Canadian National Championships, 3 Continental Championships, a Gold medal at the first Pan-American Games and a Bronze medal at the first Commonwealth Games that included women’s boxing. Most recently during the Toronto 2015 Pan-American Games, Mandy successfully defended her title and became the only female boxer in history to win two Pan American Games titles. Mandy’s dedication and discipline have made her a great competitor and ambassador for the sport. She was an ambassador for the Pan-American Games 2015 (Toronto, Canada) and now earned her ticket to Rio de Janeiro, Brazil; where she will be fighting for GOLD at the 2016 Summer Olympic Games.